Home / News / HOT TRENDS IN INDOOR CEILING FANS – MEET MINKA AIRE! HOT TRENDS IN INDOOR CEILING FANS – MEET MINKA AIRE! Just as fashion changes each season, ceiling fans have fashion trends too – which is why we are so excited about the Minka Aire line of indoor ceiling fans. These fans are truly some of the best ceiling fans, providing the perfect blend of form, function, and design. Although Minka Aire indoor ceiling fans have a style all their own, they come in a variety of decorative styles to fit every home, whether that home be in a traditional style, modern style, or anything in between. 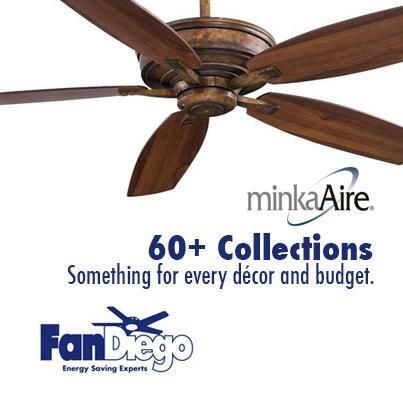 In truth, there are more than 60 collections available within the Minka Aire line of ceiling fans alone! Wing fans come in wood finishes with a single arched blade circling the pendulum. Others include ornate metal work carefully sculpted around lighting fixtures beneath beautifully crafted wooden blades. Yet others still bring in steel-like metals for a clean, modern look. The variety is endless and the craftsmanship remains flawless across the entire line. One of the great things about Minka Aire ceiling fans is that every detail is so beautifully planned. These ceiling fans allow the owner to get the truly perfect finishes each and every time – in fact, there are more than 80 finishes available for the Minka Aire line of indoor ceiling fans. Beyond the standard white, oil rubbed bronze, chrome, and brushed nickel, there is a variety of exciting and customized looks, such as Vineyard Patina, a gold-like finish with flecks of red-brown patina throughout or the array of wood finishes, including maple, mahogany, variations of koa, and walnut, to name just a few. These ceiling fans have the perfect finish to satisfy even the most particular and refined of tastes. One of the most sensible features of the Minka Aire indoor ceiling fans is their energy efficiency. Going green may be more a lifestyle than a hot trend in itself – and Minka Aire is happy to keep green living as an important part of its offerings. There are nearly 70 fans in Minka Aire’s current collection of ceiling fans alone. Energy Star certified ceiling fans can be found through every design style and with fans featuring anywhere from one to five blades – not to mention indoor ceiling fans with lighting. The Minka Aire line of indoor ceiling fans truly has something to offer to everyone. Though the collections provide a wide variety in finishes, styles, and amenities, each of the Minka Aire ceiling fans provide superior performance and maximum comfort. For more information about our Minka Aire ceiling fans, call us at 800-240-6267 or visit one of our four Southern California showrooms. You can also buy ceiling fans online.